On SUPERMAN I & II, Stuart (Freeborn) turned the little store room that backed onto his make-up room into a mini laboratory. He would spend hours in there tinkering with ideas between make-ups. One particular effect sticks in my mind. For a couple of weeks I noticed him experimenting with lamps, gels, a 60% reflective (surface coated) mirror and a plastic bag of strange translucent beads. He was devising the effect of Superman absorbing the nuclear explosion in Superman II. When he explained it to me, it was cunningly simple, but the best effects always are. These are the details of Stuart's ingenious design. 1. First he got the Art Department to model a half sized Superman, which Graham Freeborn and I molded in gypsum. 2. I made a foam latex replica which Stuart artworked. 3. The Wardrobe Dept. made a perfect half sized costume complete with flowing cape. 4. Stuart covered the model with 3M beads. These are loose reflective beards made by 3M to go on road signs that reflect car headlights at night. Any light that is shone on them reflects right back to the source. (See the story the cops dilemma). 5. Stuart mounted the model on an electric motor so that the motor was below the model's feet and it spun vertically like an ice skater. He fitted a dimmer to the motor so that he could control the speed at which it spun. 6. The figure and motor were then mounted above a horizontal blue matte so that the background optical of the explosion could be put in later. 7. 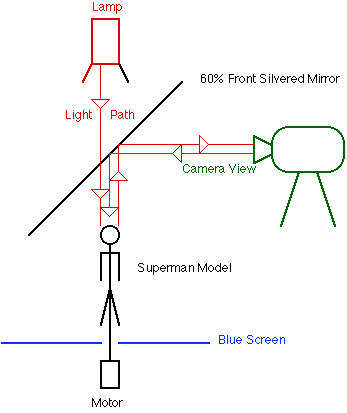 A 60% reflective (two way) , surface coated, mirror was placed, silvered side down, directly above the model, at a 45° angle to the horizontal plane, (90° angle to the vertical plane). The camera viewed the model via it's reflection in this mirror. 8. A narrow beam lamp, with a vibrant red gel, was placed above the mirror. Its beam, (when lit), passed vertically through the two way mirror and shone on the model. This too was on a dimmer. 9. The zoom lens on the camera was set as wide as possible without exposing the setup. This made the figure look like it was a long way away. 10. The mirror was invisible to the camera. When the camera first turned over the lamp was off. The Camera slowly zoomed in towards the figure. This made it appear as if Superman was getting closer and the figure spun slowly. 11. As the figure appeared to get closer it spuns faster and the power was brought up on the lamp. The red light from the lamp passed through the mirror , hit the 3M beads which covered the model and reflected the light back to the silvered side of the mirror and into the camera. When the background optical was added it appears as if the rotating Superman suddenly absorbs the atomic energy and glows like a red hot poker. It was because of designs like this that Stuart get a credit for "Special Visuals"